After the second consecutive whiteout game at Penn State, many things pondered in my mind. Penn State has not lost a football game at home this season to this point. I know that they have been riding a wave of momentum since upsetting the Buckeyes, but I am wondering if home field advantage in sports is real and affects the opposing team. As I am watching the game last night between Iowa and Penn State, It is third down. The crowd is pumping extreme levels of volume into Iowa’s offense. In fact, James Franklin, Head coach of the Nittany lions wanted this whiteout to take place. To start this blog post off, I am going to define exactly what home field advantage is. In sports, the home team hosts the opposing team. 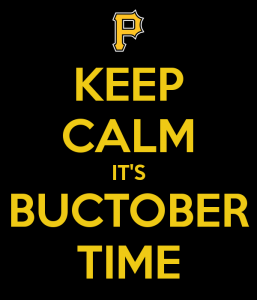 There is a “rumor” that the home team has an advantage because they are playing where they are comfortable. Many aspects go into Home field advantage, testosterone is probably the biggest. Home field advantage is present in all sports, whether the sport is played indoors out outdoors. For the purpose of this blog post, I looked at America’s three most popular professional sports and examined their home field advantage statistics. The first is the NBA. 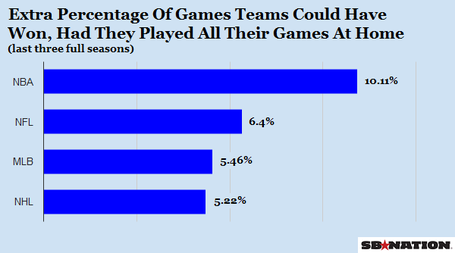 In the NBA it is actually the highest supporter of the home field advantage belief. I found that in the NBA, teams are 60.5 % more likely to win at home than on the road. Currently in the NBA, the Warriors have the best chance to win at home. The next is the MLB. In the MLB you are more likely to win 53.9% of the time, for example the Pirates. They have created a term called “Buctober” when the Pirates play at home, they are an entirely different team. 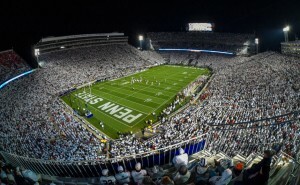 In college football home field advantage matters, and we all know this from Penn State. The whiteout is everything. 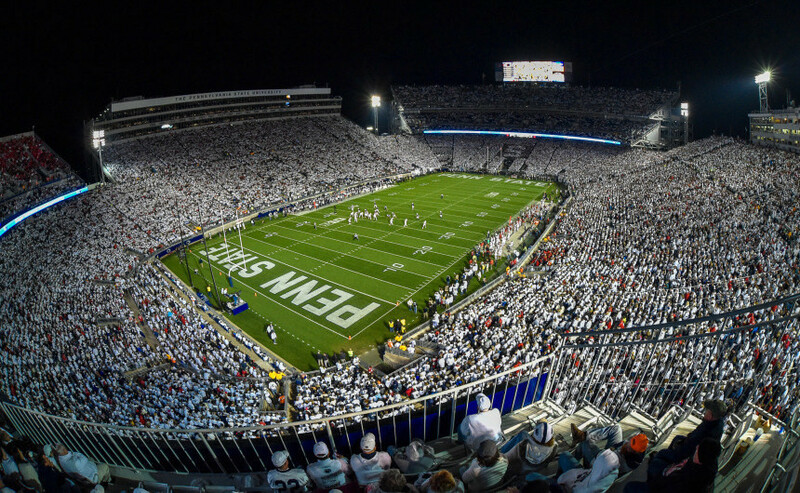 Here at Penn State, we know what it means to host a football game. The tailgating, the student section, the blue band, and of course the greatest atmosphere in college football. The referees are also skewed to the home team during a game. A study that I examined for this issue, looked at soccer in England and showed the relationship with home field calls and refs. The results were as I expected, it showed that teams were more likely to get a call go in their favor while playing at home.This is because of pressure form the fans and as well as pressure to the home teams coach. In the NBA one season, it was found that 8 teams actually got less calls at home, this is against the belief but they are 30 teams total. To wrap up my blog post , I made this in the intention of finals figuring how sentimental home field advantage is to teams in sports, it is everything. Over the years of playing sports it even has affected me in more than one way. There is nothing like a high school student section supporting me. This entry was posted in Uncategorized on November 6, 2016 by Michael David Kresovich. As an avid sports fan I really enjoyed reading this post. I myself wrote a very similar blog last blog period and found some similar results. As a Penn State student there is nothing better than the seven home football games every fall. That is why I rushed up here yesterday to see the team clinch their spot in the Big Ten championship game. The environment of Beaver stadium absolutely contributed in part to the teams perfect 7-0 home record this year. Here is an article I used from SB nation that shows statistics of better performance for home teams in college football. This post really caught my eye because I just finished watching the Penn State vs. Michigan State game on television since I couldn’t make it back to Penn State in time. It was crazy watching a home game from the TV because I could hear the student section almost as if I were there. Penn State’s student section is ranked the best one according to ESPN. There was even a survey taken this year asking players in the big 10 which stadium was the hardest to play in, and six out of the thirteen contestants voted Beaver Stadium. I can attest to the student section getting pretty crazy during the game, and I am proud to be apart of it! WE ARE! Michael- I loved this post. There really is nothing quite like being in Beaver Stadium and rooting on the Nittany Lions. It was been said that the atmosphere here in Happy Valley is one of the toughest to play in and I can certainly see why. We don’t exactly make it easy on our opponents to do their jobs. I thought you post was great, however I would have liked to see some more in-depth reasoning as to why home field advantages work the way they do. If you had provided facts on how noise levels effect teams, the psychology of playing at home vs. playing away, or maybe even some personal player experience from professional teams, that would have helped your argument out a lot. With that being said, I still think this was a great post. I think that this is a very interesting topic for a blog post! It seems very plausible that the home field advantage theory is correct. Even from personal experience, the cheering of a crowd and the pride of being on your own turf seems to stimulate motivation. It seems as if your theory on the home field advantage being relevant to college football is anecdotal considering you only mentioned the evidence of one team for one season. However the statistics that you mentioned for the NBA and MLB are convincing! I found an article that might interest you about how the cheering from fans can actually cause anxiety for a sports player. This blog post is great and definitely catches every students attention after all of our home game wins this season! I agree that the motivation of the student section, blue band, lionettes, and families cheering the team on certainly gives them an advantage and probably pressures the refs to make calls in their favor. This is something that can’t technically be proven as a cause for the win, but they correlate. Could it also be just considered a coincidence as well? or could the motivation to play better be dependent on the person? http://www.personalityresearch.org/papers/rabideau.html In this article it goes into depth how a person reacts to social motivation and how its different per person. Some people can perform great under lots of pressure (an entire stadium of people cheering you on) compared to others who may be better when less people are cheering because to them, it might feel as if less people are watching. Good post Michael! Obviously, you aren’t done yet, but I did enjoy where you were going and hope you continue down that path. I would definitely further relate to class and maybe find some other studies to back up your argument. My question for you is this-why does the NBA have a better chance of winning a game if they played at home, over the NFL, MLB, and NHL? What about the NBA has a more likely chance of winning?